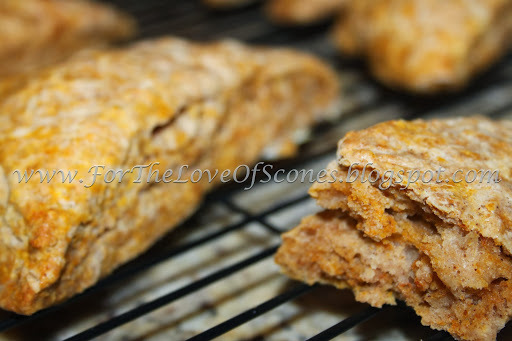 Pumpkin scones are tasty all times of the year, but especially in Fall. If you really want these to be Thanksgivingy, add a cup of dried or fresh cranberries to the dough after the pumpkin puree. Pumpkin and cranberry would go excellent together for a Thanksgiving morning breakfast! 1. 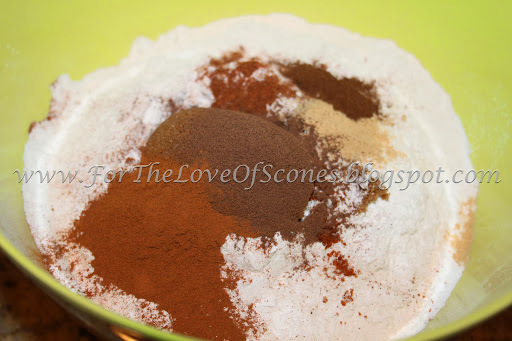 Combine dry ingredients (spices, sugar, baking powder, salt, flour) and whisk. 2. 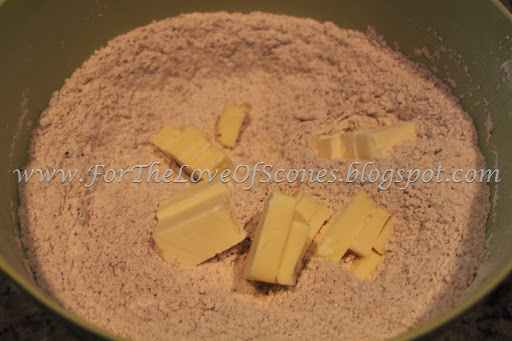 Add 3/4 cup butter and work in with a pastry blender until the mixture resembles coarse sand. 3. 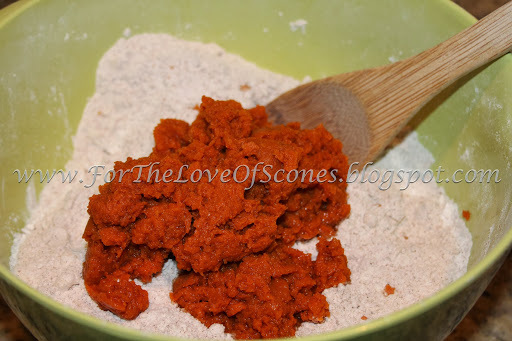 Add the pumpkin puree and mix with a wooden spoon until relatively uniform. Optional: Add the cranberries, careful not to smash them if you’re using fresh cranberries. 4. In a medium-sized bowl, combine buttermilk, vanilla extract, and eggs and whisk lightly to mix. 5. Add buttermilk mixture to dry ingredients, 1/3 at a time, and mix until just comes together. If more liquid is needed, add some additional buttermilk in order for the flour to just stick after a knead or two. 6. Brush with buttermilk and bake on a parchment lined baking sheet at 400F for 12-18 minutes, or until golden brown. 7. Transfer to a wire sheet and cool for at least 5 minutes before serving. Ingredients measured and ready to go. 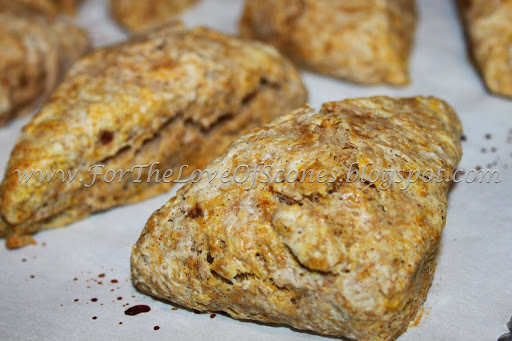 A gorgeous array of spices adorn this scone. 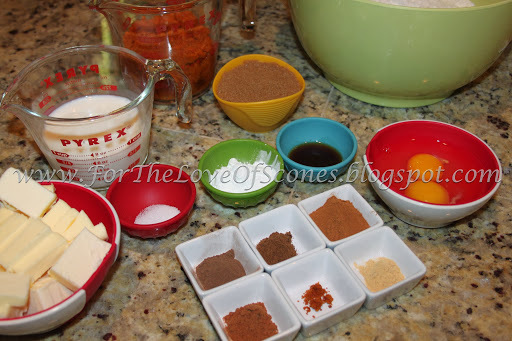 Combine the dry ingredients, spices, flour, sugar, baking powder, salt and whisk to mix. 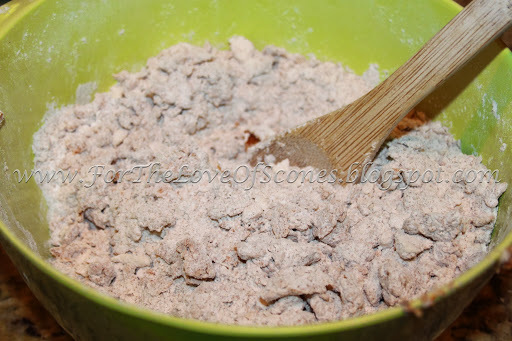 Add the butter and work in until the mixture resembles coarse sand. Add the pumpkin puree and mix well with a wooden spoon. 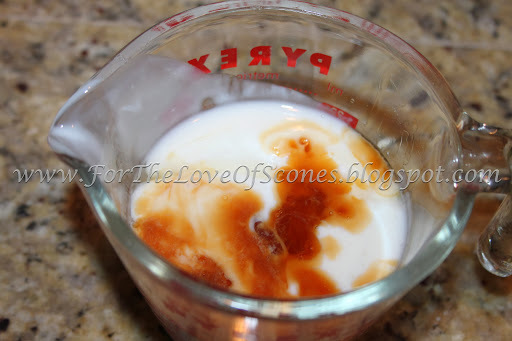 In a medium sized bowl, combine the vanilla extract, eggs, buttermilk, and whisk lightly to mix. 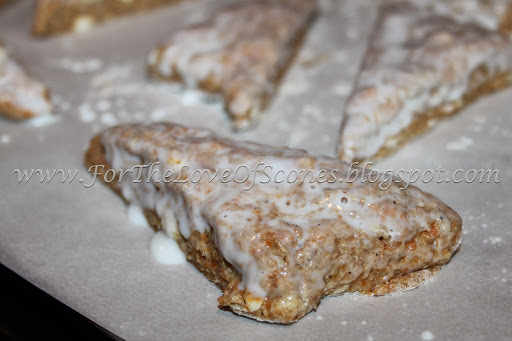 Add the buttermilk mixture to the dry ingredients and mix until the flour just comes together. If you need more buttermilk, add it here. 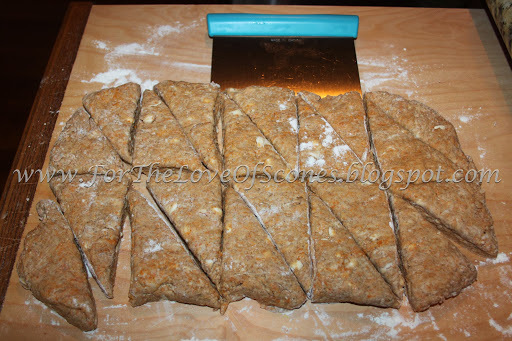 Turn the dough out onto a lightly floured countertop and flatten into a long, wide rectangle. *Shown above is the full, 20-scone recipe. Transfer to a parchment-lined baking sheet and brush with buttermilk. These were moist and flavorful. 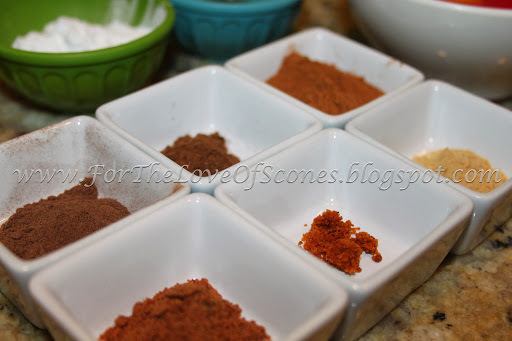 I like my spices, so I would add even more spice next time.